This was shot at the Vancouver Olympics, just after Canada won the gold medal for hockey. 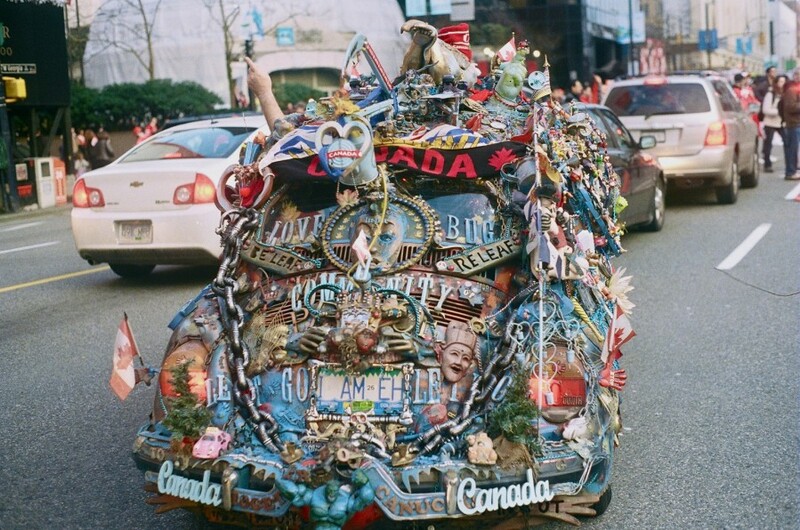 It brought great joy around Vancouver; an exciting moment for locals and tourists alike. It belongs to a great fellow named Marc, with whom I currently work with. Marc donates his time, his car, and even his movie collections to people experiencing autism. This car actually changes from time to time. In fact, sometimes the car has a working water fountain with mermaids and different sculptures. However, I think this time it was a special Olympic model. I’ve been privileged to be with him in meetings about life and this car. The picture was shot with a Minolta SRT 201 and 400-speed Kodak Film. To see more of Jules’ awesome work, head to his Flickr page or his website www.julesandrebrown.com. For those interested, digital prints of his work are available for purchase, drop him a line at [email protected] Congratulations Jules, we look forward to more of your work. We are excited about TheExpeditioner’s Flickr group and all the amazing submissions we are receiving daily. If you have a Flickr membership, we invite you to check out the shots, join us, and get uploading! Here’s a list of our past winners. For next month’s contest, we are looking for the very best landscape shot from your travels! So scour those hard drives and get them posted for your chance of winning a feature the first friday of June! Happy travels, everyone!